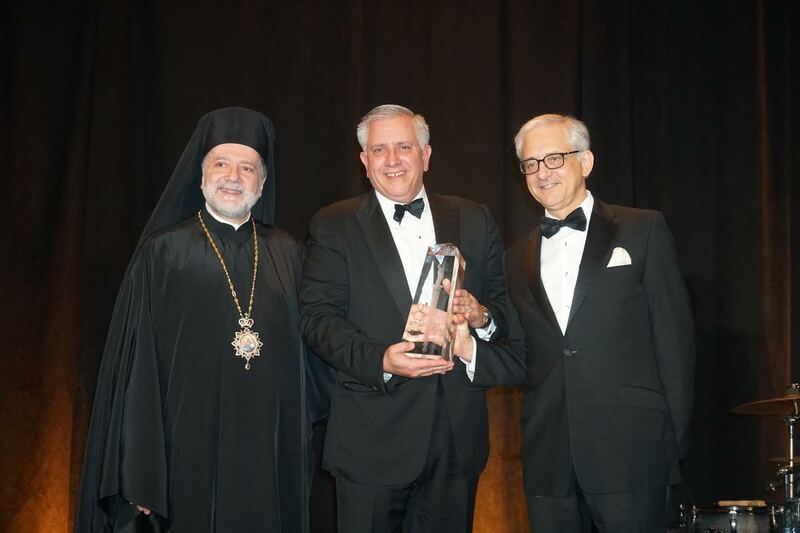 Outgoing Chairman George S. Tsandikos, right, passes the Torch of Leadership to new Chairman, Argyris Vassilou, center, while Metropolitan Nicholas of Detroit looks on. 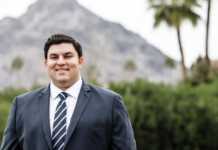 Leadership 100 installed Argyris “RJ” Vassiliou of Stamford, Connecticut, a business executive and engineer, as Chairman, at the Grand Banquet of its 27th Annual Conference on Saturday, February 3, 2018 at The Ritz-Carlton Key Biscayne, Miami in Key Biscayne, Florida. George S. Tsandikos, outgoing Chairman, passed the Torch of Leadership to Vassiliou, thanking Leadership 100 members for their support during his tenure. 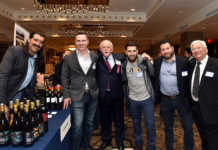 Vassiliou is the President of two family-owned businesses, Acme Pallet Company, Inc., an industrial engineering concern, based in New York City, and Di-Cor Industries, Inc., a specialty structural steel fabrication company, located in Bristol, Connecticut. He was educated at The Cooper Union for the Advancement of Science and Art, receiving a B.C.E. degree in 1989, and at Princeton University, receiving a M.S. degree in 1991. Married to the former Ann Pappajohn, they have two children, Alexandra and Nicholas, and attend the Church of the Archangels in Stamford, Connecticut. 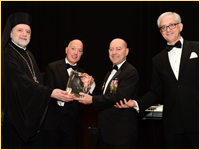 George S. Tsandikos, far right, Metropolitan Nicholas and Michael G. Psaros, second from left, present Archbishop Iakovos Leadership 100 Award for Excellence to Admiral James Stavridis. Vassiliou served as Leadership 100 Vice Chairman for the past four years. He will be succeeded by Jim G. Logothetis of Chicago, a Senior Partner at Ernst & Young. 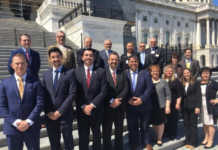 Kassandra L. Romas of Short Hills, New Jersey, continues as Secretary and Thomas G. Jordan of Bloomfield Hills, Michigan as Treasurer. Some 500 members and guests attended the Conference which featured a keynote address by Admiral James Stavridis, formerly Supreme Allied Commander at NATO and currently Dean of The Fletcher School of Law and Diplomacy at Tufts University. Stavridis spoke on 21st Century Security: Challenges and Opportunities. He was introduced by Michael G. Psaros, member of the Leadership 100 Board of Trustees and was presented with the Archbishop Iakovos Leadership 100 Award for Excellence by Chairman Tsandikos and Metropolitan Nicholas of Detroit. 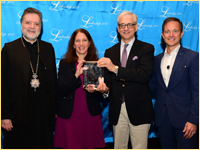 George S. Tsandikos and Metropolitan Nicholas present Archbishop Iakovos Leadership 100 Award for Excellence to Sylvia Mathews Burwell, while Mike Manatos, far right, member of Executive Committee, looks on. Other speakers included Sylvia Mathews Burwell, the former Secretary of the U.S. Department of Health and Human Services and current President of American University, who was also presented with the Archbishop Iakovos Leadership 100 Award for Excellence and John P. Angelos, Executive Vice President of the Baltimore Orioles and President and Chief Operating Officer of the Mid-Atlantic Sports Network (MASN). Burwell spoke on Hellenic Values and Health Care: What My Greek Heritage Taught Me About Public Policy. She was introduced by Mike Manatos, member of the Leadership 100 Executive Committee. 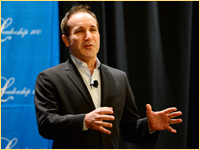 Angelos spoke on A 25 Year Evolution of the Intersection of Sport Media and Society. He was introduced by George Anderson, a member of Leadership 100. In addition, the Very Reverend Archimandrite Nathanael Symeonides, Director of the Office of Inter-Orthodox, Ecumenical and Interfaith Relations of the Greek Orthodox Archdiocese of America, conducted a panel titled Transforming the World through Collaboration: The Work of the Department of Inter-Orthodox, Ecumenical and Interfaith Relations with four participants: Dr. Carrie Frederick Frost, Professor at Saint Sophia Ukrainian Orthodox Seminary, Joyce S. Dubensky, CEO of Tanenbaum, Christina Hioureas, Counsel at Foley Hoag LLP, and Dr. Elizabeth H. Prodromou, Visiting Associate Professor of Conflict Resolution at The Fletcher School of Law and Diplomacy at Tufts University. Nicholas Anton, Coordinator of UN Programs and Special Assistant in the Department, also joined the panel. John P. Angelos addresses Forum at Conference. Special recognition was given to Peter J. Pappas, a longtime member of the Leadership 100 Executive Committee and Board of Trustees and a prominent business leader and philanthropist, at the General Assembly on Friday, February 2, 2018. 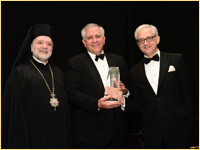 His wife, Cathy, accepted the memorial Commendation for Distinguished Service to the Board of Trustees presented by Archbishop Demetrios and Chairman Tsandikos. 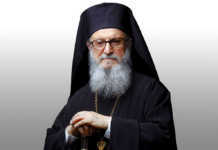 Archbishop Demetrios delivered both the traditional Bible Study and Lecture. Metropolitans Nicholas of Detroit and Savas of Pittsburgh also attended. Chairman Tsandikos and Lou Kircos, a member of the Leadership 100 Board of Trustees, conducted an Open Dialogue at the Opening Forum of the Conference on Thursday, February 1, 2018. Both the Leadership 100 Executive Committee and Board of Trustees met on Wednesday, January 31, 2018. The Executive Committee approved grants for 2018 totaling $2.7 million, bringing grants distributed by Leadership 100 since its founding to more than $50 million. Chairman Tsandikos reported that membership had increased to 1,072, with 628 members fulfilled and assets topping $100 million for the first time. The Conference concluded with the Hierarchical Divine Liturgy celebrated by Metropolitan Savas at Saint Sophia Cathedral in Miami on Sunday, February 4, 2018.